Good morning! I wanted to establish a "Friends" thread to provide news, updates and deals to the BS community. I have been browsing and reading for the past couple of weeks to learn my way around BS and have found a wealth of information, thank you all for this. Please pay us a visit sometime! ShinyBars is a Veteran Owned Small Business that was launched as a gold and silver retailer in April of 2013. The business is 100% Veteran owned and operated. Our number one priority is YOU, the customer! We achieve customer satisfaction by offering quality products at competitive prices and communicating with our customers in a courteous and effective manner. Additionally we ship orders fast. We take a WYSIWYG (What You See Is What You Get) approach to inventory management meaning that our actual inventory levels are presented on each products page. We do not over-sell nor do we sell products that are not yet locked in with our suppliers. Products that are locked in but not yet in our inventory are clearly marked and categorized in our Coming Soon section and available for you to lock in the market price you want. We have thousands of satisfied customers. We encourage all of our customers to Contact Us and write a testimonial! As a small business our ability to provide live support is currently lacking. But rest assured, we will support you and answer any questions that you may have and ensure that your gold and silver bullion is shipped safe, secure and fast! Please use our Contact Us page or email sales@shinybars.com to reach us. Payment Methods: PayPal, Check, E-Check, Money Order, Bitcoin, and Litecoin. E-Check requires verification. Simply contact me if you are interested in using the e-check payment method in the future! Shipping Information: U.S. Orders over $99 ship FREE! We also ship internationally to Australia, Canada, United Kingdom, Germany and France. RECENT UPDATE: We integrated various local currencies for our international customers. Currently supporting: Australian Dollar, Canadian Dollar, Great Britain Pound and Euro. We'll add more as we expand to other international locations. You may select your currency on the top left of ShinyBars. We also offer Bitcoin and Litecoin estimates via the same method. Last edited by shinybars on Tue Feb 09, 2016, edited 3 times in total. Now Carrying YPS Products & Free Shipping Over $99! Second, we are pleased to announce that we began carrying Yeager's Poured Silver products this week and plan to continue expanding on their product line. We are running a 2015 American Silver Eagle deal at Spot+$2.45 for 4 hours only! Domestic shipping is free for orders over $99. 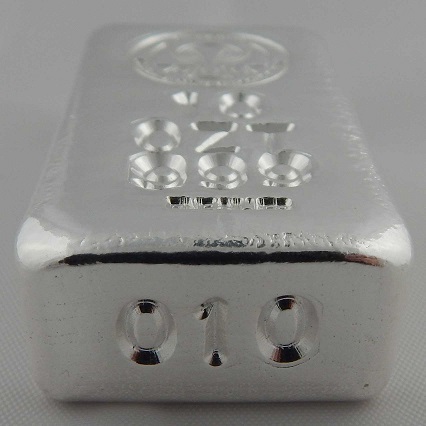 On the heels of our popular 5oz Hand Poured Silver "Bricks" we created a 10oz version. This is my personal favorite because of the chunky feel and the nice smooth faces/rounded edges that this pour ends up with. Each bar is individually serial numbered. We have a hand full of 2016 Silver Eagles running at $2.35 over spot for any quantity. Free domestic shipping over $99 as always. Let me know when you get more of those 10 oz. bricks in. Those are sweet! Silvervein wrote: Let me know when you get more of those 10 oz. bricks in. Those are sweet! Thanks! We blew through our silver shot allocation for the 10 oz bars. There is a pile of generic stuff laying around that we are going to melt to make more 10 oz bricks until more shot arrives so they will be available (at least 6 of them) in the next two days or so. We poured 6 more bricks yesterday evening. They are up for sale and will be stamped/polished today. We are trying something a little different and offering up unique items for auction! The first auction was just launched this morning and is a 1oz "Reject" Silver nugget. There is a beautiful 2 oz Silver Rose that will be launched at 11:00 EST. We will periodically add new and unique items to the auction page so keep checking back! Love the looks of those bricks. Sales tax kills it for me though. fredzoyt wrote: Love the looks of those bricks. Sales tax kills it for me though. Our shopping cart doesn't have the tax exemption functionality built in, but if you are interested just place an order (let us know) and hold off payment until we manually adjust the amount due. 2016 SAE's @ $1.99 Over on Tubes of 20! 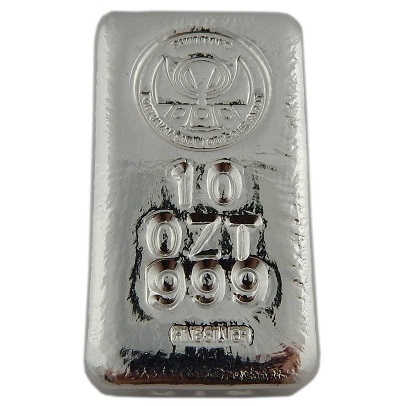 ShinyBars 10oz Poured bars @ Spot+$0.79 for the weekend! This includes our 10 oz Loaf, 10 oz Kit Kat and 10 oz Bricks. We also have some 1 oz JM's at a decent price if you are interested! We have a few deals running over at ShinyBars! We are offering 2015 1 oz Silver Kangaroo's $2.25 over spot (cash pricing) on any quantity. These have a mintage limit of 300k. Next, our ShinyBars 10 oz Bricks, Kit Kat and Loaf bars are running at only .89/oz over spot. We have a couple hundred $'s face value of junk quarters @ Spot+$1.09 cash pricing for 4 hours only! EDIT: I also meant to add that we have two 10oz bars up for auction (ending tomorrow). One is a Wall Street Mint bar and the other is a Scottsdale Reserve poured bar. ShinyBars Auctions can be found HERE. EDIT: The Chiwoo's and Archangel's are all from sealed tubes/boxes...not cherry picked! Last edited by shinybars on Wed Oct 18, 2017, edited 1 time in total.